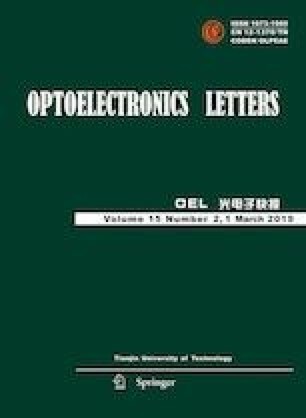 Epitaxial growths of the GaAs/AlGaAs-based 940 nm infrared light emitting diodes (LEDs) with dual junctions were carried out by using metalorganic chemical vapor deposition (MOCVD) with different doping concentrations and Al contents in AlxGa1-x As compound. And their optoelectric properties show that the optimal design for tunneling region corresponds to P++ layer with hole concentration up to 1×1020 cm−3, N++ layer electron concentration up to 5×1019 cm−3 and constituent Al0.2Ga0.8As in the tunneling junction region. The optimized dual-junction LED has a forward bias of 2.93 V at an injection current of 50 mA, and its output power is 24.5 mW, which is 104% larger than that of the single junction (12 mW). Furthermore, the optimized device keeps the same spectral characteristics without introducing excessive voltage droop. This work has been supported by the National Key Research and Development Program of China (No. 2017YFB0403101), and the National Natural Science Foundation of China (No.61474096).